Throughout his life, it seems, Jayavarman immersed himself in the teachings of Mahayana Buddhism—the variant still followed in much of northern Asia. More than any other king, he labored to integrate Buddhist with Cambodian ideas of kingship. Buddhist kingship, as he practiced it, differed in several ways from the more eclectic Hindu model that had been followed for centuries at Angkor and was to form the ceremonial basis of Cambodian kingship until the institution was temporarily overturned in 1970. In the traditional version, a king was thought to enjoy, whether he was alive or not, a special relationship with a particular deity—usually Siva, more rarely Vishnu, occasionally the composite of them both known as Harihara—to whom his temple-mountain was eventually dedicated. The kings used this special relationship to explain their grandeur while their subjects assumed that the relationship had something to do with the provision of adequate rainfall. Because Cambodian society was organized hierarchically, and because the king was thought to centralize the kingdom, most Cambodians, like their contemporaries in medieval Europe, probably recognized the necessity for a king. Rare inscriptions, and perhaps the act of constructing reservoirs, indicated that an individual king occasionally had his subjects’ general welfare on his mind. In human terms, however, the king was nearly always a distant, mysterious figure concealed inside an awesome palace. The notion that he was accountable to his people does not seem to have caught on. Inside his palace, and within the network of kinship and preferment relationships extending from it, the king was the master and the victim of a system whereby people clamored for his favors, for titles, for the right to own slaves or sumptuous possessions. Buddhist kingship, of course, grew out of this Indian tradition (the Buddha had been an Indian prince), but in Jayavarman’s reign these notions were modified in several ways. Jayavarman was no longer seen as the devotee of a divinity or as drawn up to the divinity in death. Instead, Jayavarman sought to redeem himself and his kingdom by his devotion to Buddhist teachings and by the performance of meritorious acts. Before examining how these ideas of kingship were acted out during his reign, we need to stress that his program was not aimed at reforming Cambodian society or at dismantling such Hinduized institutions as Brahmanism, slavery, and kingship. Far from it. In his conservatism, his ongoing tolerance of Hinduism, and his elitist frame of reference, Jayavarman VII was a recognizably twelfth-century king, although in Cambodian terms he was also perhaps a revolutionary one. Put very starkly, the difference between a Hindu king and a Buddhist one is akin to the difference between a monologue that no one overhears and a soliloquy addressed to an audience of paid or invited guests. A Hindu king’s rule was an aggregation of statements—rituals, temples, poems, marriages, inscriptions, and the like—that displayed his grandeur, acumen, and godliness. A Buddhist king made similar statements, but he addressed many of them, specifically, to an audience of his people. This made the people less an ingredient of the king’s magnificence (as his thousands of followers had always been) than objects of his compassion, an audience for his merit-making and participants in his redemption. This, at least, is what many of Jayavarman VII’s inscriptions and temples appear to have been saying. Why did Jayavarman VII choose to break with the past? Scholars have several explanations. These include his apparent estrangement from the court at Angkor, combined with his resentment toward the usurper who had proclaimed himself king in 1167; and his having a “master plan” of buildings, ideology, and kingship that had been maturing in his mind after years of study and very possibly the influence of a scholarly, ambitious wife. These proposals are helpful, but they do not identify the real key to Jayavarman’s reign—the Cham invasion of Angkor in 1177. Paul Mus and Jean Boisselier have argued that we can see Jayavarman’s entire reign as a response to this traumatic event. Jayavarman’s own links with Champa were close, and in the 1160s, he may have spent several years there. It’s likely that his absence from Angkor was connected in some way with his being out of favor at the Cambodian court, for he returned home only after Yasovarman II had been deposed. As the sources of our uncertainty are Jayavarman’s own inscriptions, all that is clear about the prelude to the Cham invasion of 1177—and indeed about Jayavarman’s early career—is that later on he found little to boast about in these obviously formative years, some of which he may have spent in his mother’s home city of Jayadityapura, east of Angkor. After he ascended the Cham throne, Jaya Indravarman IV (fl. 1170s) invaded the neighboring Khmer Empire (Cambodia and Laos), partly from motives of traditional enmity and partly to loot its vast stores of treasure. In a battle of 1171, the Chams won victory, in part, by using horses against the Khmers rather than the traditional elephants. The horses were a significant tactical innovation, providing greater speed and mobility and allowing the Chams to outmaneuver their enemy. The Chams emphasized shock tactics, which required speed and surprise. Unfortunately for Jaya Indravarman, he could not obtain horses in China’s Kwangtung and Hunan provinces to use in a full-scale invasion of Khmer. In 1177, however, he attacked successfully by sea, sailing a fleet up the Tonle Sap (central Cambodia’s “Great Lake”) and the Siemreab River to take the undefended Khmer capital of Angkor. Jaya Indravarman burned the wooden city and ravaged its sacred temple (Angkor Wat), stripping it of treasure. He then ordered the death of the Khmer rebel king Tribhuvanadityavarman (fl. 1166-77). The Khmers were rallied by King Jayavarman VII (c. 1120-c. 1215). 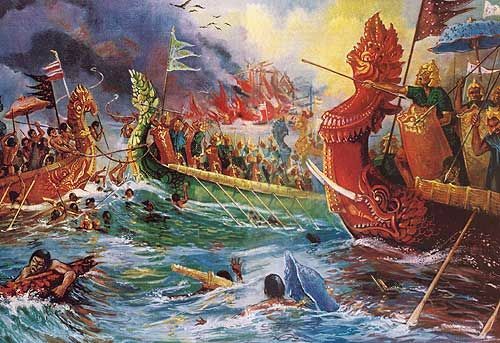 In alliance with Thai forces and exiled Chams, the Khmers fought back, winning a significant sea victory in 1181. Jayavarman retook Angkor, rebuilding it as Angkor Thom, north of the old city. 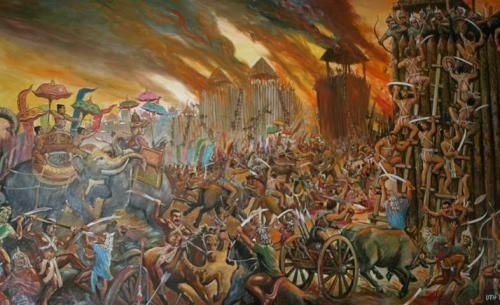 By 1190, he mounted an invasion deep into Champa, laying waste to much of its territory and destroying its capital city of Vijaya (Binh Dinh). Champa, defeated and conquered, was divided into two states, which were vassals of the Khmer Empire. The lengthy Khmer-Cham War (1167-90) resulted in the conquest of Champa by the Khmer Empire. Within a year after the conclusion of this war, however, in 1191, the Chams rebelled. In short order, one of the two Khmer puppets, Prince In (d. after 1203), was overthrown by a Cham prince, who was subsequently crowned King Jaya Indravarman V (d. c. 1192). Jaya Indravarman next marched against and defeated the Khmer puppet ruling the other half of Champa, and Champa was once again reunited under the new king. Jayavarman VII was crowned in 1182–83, therefore, owing little to his predecessors and much, as his inscriptions tell us, to his acumen, his Buddhist faith, and his victories in battle. It’s clear, however, that the period between victory and assuming power must have been filled with political negotiations and further conflicts—with the “many parasols,” perhaps. Over the next thirty years or so (the precise date of his death is unknown), he stamped the kingdom with his personality and his ideas as no other ruler was able to do before Norodom Sihanouk in the 1960s and Pol Pot later on. Like these two figures, Jayavarman may have wanted to transform Cambodia and perceived himself as the instrument of that transformation. For example, many of the bas-reliefs on the Bayon, depicting battles against the Chams, contain vivid scenes of cruelty. Similarly, some of Jayavarman’s inscriptions praise his vengefulness and his skill at political infighting vis-à-vis the Chams. On the one hand, the portrait statues of him that have come down to us depict him as an ascetic deep in meditation. From his so-called hospital inscriptions we learn that “he suffered from the illnesses of his subjects more than from his own; the pain that afflicted men’s bodies was for him a spiritual pain, and thus more piercing.” Yet, on the other hand, his roads, temples, “houses of fire,” reservoirs, and hospitals were thrown up with extraordinary haste between his coronation in 1182–83 and the second decade of the thirteenth century; some were completed after his death. There were so many of these projects, in fact, that workmanship was often sloppy, and by the end of his reign local supplies of sandstone and limestone for use at Angkor may have begun to run out. Hundreds of thousands of ordinary people, inscriptions tell us, labored to erect and maintain these constructions built, at the ideological level, to deliver them from pain. To a twenty-first-century eye, this seems ironic, but we should remember that suffering in Buddhist terms should not be taken merely in a physical sense; it must also be related to the purposes of life and to the ways that suffering of certain kinds can serve the teachings of the Buddha. As it would be with other Cambodian kings, making a sharp distinction between Jayavarman’s politics and his religion, between temporal and spiritual powers, and between his ideas about himself and his ideas about his kingdom would be wrong. Before we dismiss him as a megalomaniac, however, it is worth recalling that had no one shared his vision or believed in his merit, he would never have become king, especially starting out from such a weak position, and he certainly would not have been able to remain in power. Many high officials, brahmans, evangelical Buddhists, and military men probably saw advantages in the physical expansion of the kingdom, partly by means of royally subsidized religious foundations and partly through bringing previously hostile or indifferent populations under some form of control. By the beginning of the thirteenth century, in fact, Angkor was extracting tribute from much of what is now Thailand and southern Laos as well as from Champa, occupying the coastal areas of central Vietnam. To these corners of the known world the multiple half-smiling faces of Jayavarman’s temple-mountain and his portrait statues addressed their benignly powerful glance. At the same time, as Michael Vickery and others have suggested, considerable resentment must have built up against Jayavarman VII in the course of his reign among disaffected members of the elite, and among formerly privileged Hindu practitioners who resented the king’s conversion. These elements of Khmer society, at the instigation of a later monarch (but which one? ), probably were responsible for the anti-Buddhist iconoclasm that affected many of Jayavarman’s major temples after his death. The art historian Philippe Stern, who studied Jayavarman’s reign in detail, perceived three stages in the development of his iconography and architecture. These coincide with the three phases of construction that Stern had noted for earlier Cambodian kings—namely, public works, temples in honor of parents, and the king’s own temple-mountain. The public works of earlier kings, as we have seen, usually took the form of reservoirs (baray). Other projects such as roads and bridges were also built, but they are seldom noted in inscriptions. But Jayavarman’s program departed from the past. His hospitals, probably established early in his reign, were an important innovation, described in the stele of Ta Prohm. Four of them were located near the gateways to Angkor Thom. Others were built to the west of Angkor into what is now northeastern Thailand and as far north as central Laos. About twenty hospital sites have so far been identified. The Ta Prohm inscription says that the hospitals could call on the services of 838 villages, with adult populations totaling roughly eighty thousand people. The services demanded appear to have been to provide labor and rice for the staffs attached to each hospital, or approximately a hundred people, including dependents. The hospital steles give details about the administration of the hospitals and about the provisions and staff allocated to them. A second set of Jayavarman VII’s public works consisted of “houses of fire” placed at approximately sixteen-kilometer (ten-mile) intervals along Cambodia’s major roads. There were fifty-seven of these between Angkor and the Cham capital and seventeen more between Angkor and a Buddhist temple-site at P’imai in northeastern Thailand. The exact purpose of these buildings is unknown. Finally, there was Jayavarman’s own reservoir, known now as the northern Baray and during his reign as the Jayatataka, located to the northeast of Yasodharapura.